Exaggerator wins the 2016 Preakness ahead of Cherry Wine and Nyquist. And Corey Lanerie on the runner-up gives winning jockey Kent Desormeaux a pat on the back as they gallop out after the wire. Exaggerator gets a Beyer speed figure of 101 for his Preakness Stakes win over Pimlico’s sloppy track on Saturday. TimeformUS gives him a speed figure of 122, the same number assigned Kentucky Derby winner Nyquist for running third, quashing a Triple Crown bid. The two go on to the Belmont Stakes for a rematch in three weeks, and now that Exaggerator has finally beaten Nyquist — in the fifth race featuring the two of them — we have a rivalry. So, what about the mud? “Thank the good Lord for raining on us today,” said a member of Exaggerator’s ownership team in the winner’s circle. “You have to think that the track means a lot to his performances, but his fast-track performances are not bad, either,” said rider Kent Desormeaux. View the official Equibase chart (PDF). 5/24/16 Update: Nyquist spikes a fever, will skip Belmont Stakes. Sealed, opened, soaked: The condition of the Pimlico track surface became the X factor in the Preakness Stakes when a torrential downpour turned the dirt to mud minutes before post time on Saturday. If anything, the rain was a boon to the 4-5 favorite, already a winner on a wet track. But nothing can be taken for granted in a Triple Crown race: “I took a chance and sent him as quick as I can,” said rider Victor Espinoza, explaining how he hustled American Pharoah from stall #1 and into the lead from the start, outmaneuvering jockey Martin Garcia and stablemate Dortmund, in stall #2, at the break. 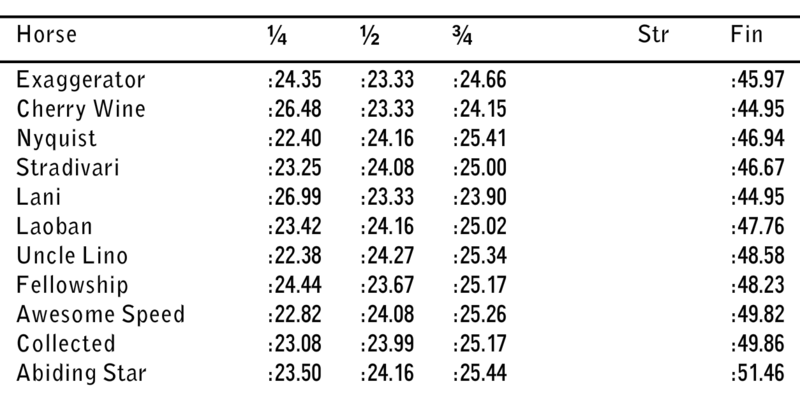 The winner’s split for the mile was :26.32, and for the final 3/16ths, :20.72 (both those numbers from the official Equibase PDF chart). So, American Pharoah slowed down at the end after a quick opening quarter, and I’m inclined not to read too much into what’s 1) a typical race shape for dirt routes, 2) a pretty good example of what we mean when we talk about tactical speed (see, not only the break, but the way American Pharoah draws away from the others rounding into the stretch), and 3) a finish without challenge (Dortmund checked out, Mr. Z tired out, and Firing Line never fired) over slop. Jay Privman reports that American Pharoah earned a Beyer speed figure of 102. TimeformUS’ figuremaker gave him 125. He was awarded figures of 105 and 127, respectively, for winning the Kentucky Derby. American Pharoah’s Preakness win was the sixth for Baffert; his Belmont Stakes start will be the trainer’s fourth shot at a Triple Crown, the third for Espinoza. The Belmont Stakes is June 6, and there are currently eight likely contenders, in addition to American Pharoah, including Preakness runner-up Tale of Verve, Peter Pan winner Madefromlucky, and Kentucky Derby runners Frosted, Materiality, Keen Ice, Carpe Diem, Frammento, and Mubtaahij. British bookies are taking bets — Ladbrokes has Pharoah at even money. 1:15 PM Addendum: American Pharoah was the only horse to gallop back without a mud mask, thanks to his gate-to-wire run, but he was carrying a little extra water weight via Espinoza’s boots. The logic behind the Triple Crown frenzy is familiar and flawed—that horse racing “needs” a Triple Crown winner, an equine superstar like Secretariat or Seattle Slew, to save itself from extinction. But would that happen? Suppose American Pharoah romps in the Preakness and then tops Secretariat’s performance in the 1973 Belmont, winning by 31½ lengths in 2:23.99, with the track announcer saying that he’s moving “like an extra-tremendous machine.” Would men weep and women swoon? Would it change the course of the sport, and somehow restore it to a time when fans flocked to America’s giant racetracks on weekday afternoons? I’m going out on a limb and arguing that it would not. It would be very cool. It would create a blip, an uptick on the EKG of the sport. And it would be great for the moment. But it would also be 100 miles wide and two inches deep. Preakness card picks are up on Hello Race Fans. D. Wayne Lukas likes what he’s seeing from the Malibu Moon colt this week: “He is coming into the race beautifully, the same way Oxbow did.” (Oxbow derailed Orb’s Triple Crown chase with an upset in the 2013 Preakness.) If Mr. Z wins, and that’s a longshot, it’s easy to imagine the stunned reaction — he’s won but once in 13 starts. “We think he can be a pace factor in this race,” TimeformUS handicapper Mike Beer writes, echoing the consensus view. “We would be surprised were he to be more than that.” What wouldn’t surprise me is if he finishes third or fourth; he’s been competitive enough to make the trifecta in races previously won by American Pharoah and Dortmund. The trainer, though, didn’t pull off this caper only for Saturday — he has a plan for Mr. Z that involves running a mile and maybe on the turf. I was frustrated by the piece done on CALIFORNIA CHROME (Lucky Pulpit)’s ownership problems. They implied that Perry Martin and Steve Coburn are not getting along due to a disagreement on where the horse is going to run but there was not enough depth to the coverage. They interviewed the loquacious Coburn but never asked him any specific questions about when and why did the relationship go wrong. It made Martin, who is anything but loquacious, seem like the villain but he does own 70 percent of California Chrome and, thus, calls the shots. There was a brief mention of him racing at Royal Ascot next month but they never really got into trainer Art Sherman’s feeling of not having him back at his home base. Plus, no video of him training in Newmarket. They tried to re-visit last year’s feel good story but didn’t develop why the relationship went bad. Considering how long the show is, no real excuse not to answer why it went wrong. Chrome’s first race back in the US will be the Arlington Million, says Martin. From a tactical standpoint, Espinoza did what he thought necessary to get American Pharoah home and that is his job. It has also been said by jockeys and trainers that the lighter, softer whips used now often act as more of a metronome than a bludgeon, tapping out the stride and keeping the horse aware of the job at hand. … was an issue only because it was the Kentucky Derby, which 16 million people watched on NBC, although I’m guessing not many of them noticed or even pretended to care until the whip count was brought up in Derby postmortems. The Churchill Downs stewards decided that the rider did nothing wrong, and Espinoza was unapologetic, which made sense because no apology was required. Jockeys are handed the whip and told to go win the race, only now it is in an atmosphere of ever-changing rules governing the use of the stick. His column does highlight just how subjective it is, assessing whip use, referencing, as others have done, how many times rider Calvin Borel struck Rachel Alexandra in the 2009 Woodward. Quantitatively, the 21 hits Borel gave the filly is closer to the approximately 20 Espinoza gave California Chrome in the 2014 Kentucky Derby. But those wins look nothing alike. Qualitatively, the 2009 Woodward and this year’s Derby do — both riders determined to win, both horses giving their all. Emotion influences perception. It’s enough to make what’s a 50% increase of one over the other seem equal.